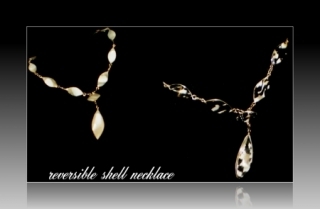 Beautiful reversible Murex Shell 20" necklace with pendant. Made with 19, 3/4" polished shell pieces, and 1 1/2"pendant, set in a fine gold filled wire setting with s links. S hook clasp. Vintage bought in Hawaii in the 1970's. Like new condition. ITEM#JNECK103 All Vintage items are previously owned may show some wear or patina with age. Photos are part of the description. Please if you have a question ask, if you want more photos happy to email to you. Thanks for looking! Please note: all items can be combined shipping. Contact me with any questions or just add items to your cart and the shipping overage will be refunded thru paypal. Paypal payments only. We ship ONLY to PAYPAL verified addresses. Thank you for stopping by!